Set the Stage Vol. 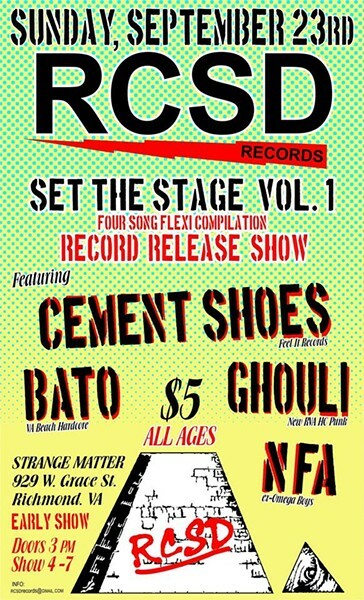 1 - Record Release Show Featuring: Cement Shoes, Bato, Ghouli and NFA. | Strange Matter | Music, Nightlife | Style Weekly - Richmond, VA local news, arts, and events. Set the Stage Vol. 1 - Record Release Show Featuring: Cement Shoes, Bato, Ghouli and NFA. Cement Shoes, Bato, Ghouli and NFA. https://cementshoes.bandcamp.com/ https://batovb.bandcamp.com/ https://ghouli.bandcamp.com https://nfa804.bandcamp.com/ Doors open at 3 p.m. and the show runs from 4 to 7 p.m. All ages.